Registration required. Click here to RSVP. 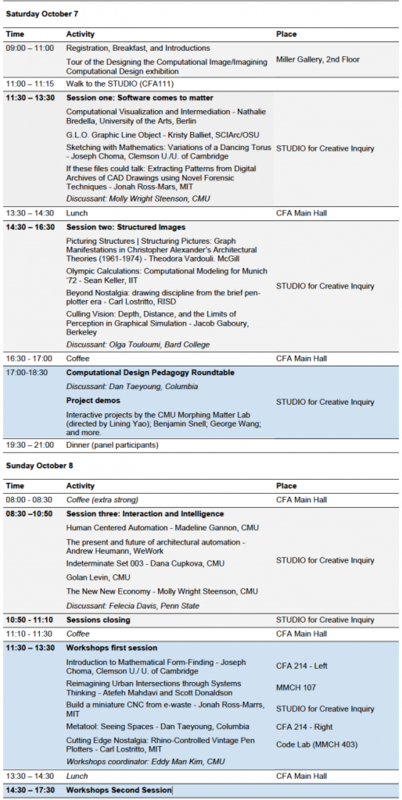 The Computational Design: Practices, Histories, Infrastructures symposium will examine computation as a subject of both scholarly and creative inquiry in design. Tracing new methods and tactics to incorporate computation as a subject of both critical and creative inquiry in syllabi and curricula in architecture and other design fields. Daniel Cardoso Llach, Carnegie Mellon (dcardoso@cmu.edu). A visit to the Miller Gallery of Contemporary Art to experience the Designing the Computational Image / Imagining Computational Design exhibition, showcasing rare drawings, films, and other materials from the formative period of numerical control and Computer-Aided Design technologies. Along with the historical materials, interactive software reconstructions and a selection of works by contemporary computational design practitioners will be showcased. A roundtable with educators and interested participants with the aim of fostering a conversation about methods and tactics to incorporate critically computation as a subject of scholarly and creative inquiry into syllabi and curricula in architecture and other design fields. There will be space for project demonstrations, WIPs, objects, demos, etc. in a tentatively called ‘Open Session’ at the STUDIO for Creative Inquiry. Check for updates soon. The Miller Gallery of Contemporary Art at Carnegie Mellon University (screening and gallery visit). The symposium and exhibition have received generous support from the Graham Foundation for Advanced Studies in the Fine Arts, the School of Architecture, the College of Fine Arts, the Frank-Ratchye STUDIO for Creative Inquiry, and the Berkman Fund for Faculty Development at Carnegie Mellon, and the Computer History Museum.